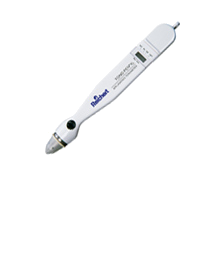 Automated Ophthalmics offers repair services for all generations of the Tono-Pen XL at a flat rate of $475. TonoPens are thoroughly cleaned, repaired, re-calibrated and tested. Accuracy and battery function are checked and then re-checked following an appropriate interval. We offer quick turn-around (usually less than two weeks) along with a 90 day warranty. Following final inspection, your TonoPen is carefully packaged and returned with a fresh set of batteries installed in the pen. Automated Ophthalmics does not attempt to disassemble and repair transducers due to the delicate nature of this component. However, we are often able to substitute a comparable transducer in good condition. If we are unable to repair your TonoPen because of damage to the Transducer, there will be no charge. You always have the option to purchase a refurbished TonoPen. Please call us at 800-242-5602 to notify us of your repair order and arrange for shipment.